Capitalists@Work: Fee, Fi, Fo, Fum - I Detect an Australian! Fee, Fi, Fo, Fum - I Detect an Australian! So onto the box saunters Cameron and what is his headline New Year message ? He's going to protect the state pension. And the headlines duly follow. What tremendous simplicity. And eminently memorable for the section of the population that exercises its vote the most. Not even anything as petty as a Brown-style 'dividing line' - because of course all the other party leaders immediately row in behind him, as they must. Behind him. That'll do. Fee, Fi, Fo, Fum - I think we detect the clear-sighted guidance of his Australian friend and pantomime villain Mr Crosby, who is keen on ditching all policy excrescences ("scraping off the barnacles") and keeping things simple, basic. So Election Campaign 2015 starts now. Let's hope that actually doing a few clear-sighted, basic things also features between now and then. Footnote: the Beeb did Dave proud in its online coverage of this little set-piece, using the photo I reproduce here. Did Crosby supply that, too ? hmm, think crosby might be pulling his hair out after the barber's gong. 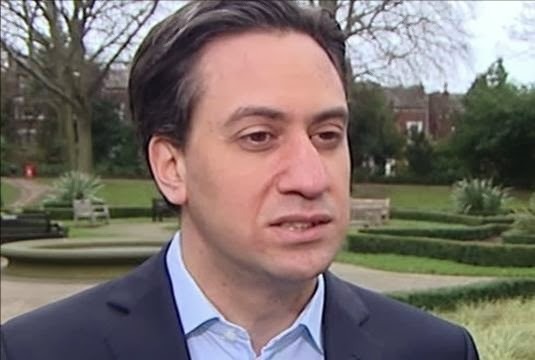 Not only does Miliband have a face you could punch, it looks like someone has. An interesting position from Cameron but if you look at it from acertain angle he is positioning pensions as just another benefit, to be withdrawn and taken away at the whim of the political class, ignoring the cntributory nature of pensions and NI. (I know before anyone says they are unfunded etc etc, but the unspoken challenge is to the idea that pensions are not benefits like jobseekers. Putting pensioners into the the 'useless eaters' category ..
"As a result [of the triple lock], the basic state pension will be about £440 a year higher from next April than it would have been if it had risen in line with average earnings since 2011-12." As there are 12.9 million State Pensioners, that seems to imply that since 2011 the coalition govt has increased state pension spending by at least £5.7 billion per year. Whoever doubted that we cross-bred with Neanderthals? pwhoahhh - I like a good Neanderthal, me. Powerful thighs.